Many teenagers don’t look forward to getting braces, but if your child needs orthodontic treatment, it’s actually the best time to move teeth into healthier positions. Under the guidance of our expert, board certified orthodontists, our exceptional residents offer many types of treatment that are created just for teenage smiles. tified orthodontists, our exceptional residents offer many types of treatment that are created just for teenage smiles. Waiting to treat orthodontic problems later in life is more difficult. It's easier to treat many orthodontic problems during the pre-teen and teenage years because the body is still growing during this time. Later in life when the facial bones and jaws are fully developed, it can be more difficult and more expensive to treat orthodontic problems. Many adolescents undergo orthodontic treatment, which makes it's easier from a social standpoint to wear braces when you're young. At the first appointment, we will provide your child with a thorough examination, which includes taking X-rays, photographs and possibly even a model of your child’s bite. Then, if we determine that treatment is necessary, our team will build a treatment plan specifically for your child that is reviewed by our panel of board certified orthodontists. 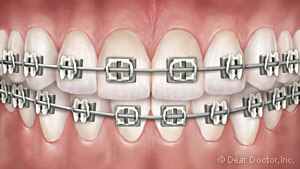 The metal braces we use are smaller, more attractive and more comfortable than the metal braces used in the past. 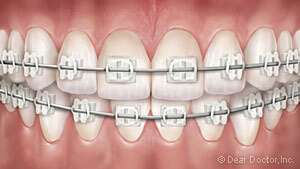 It is even possible to customize metal braces using colored elastic ties on the brackets. Clear braces are made of a transparent, ceramic or composite material, which makes them a very discreet treatment option that others will hardly notice. These braces can be used to treat many orthodontic problems, but they do cost more than metal braces. 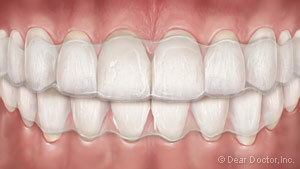 Clear aligners are a series of removable, clear plastic trays that gradually move teeth step-by-step. When first introduced, clear aligners were made for adults. Nowadays however, these aligners are made for teenagers as well and come with special features for teens like compliance indicators that show you often the aligners have been worn. Clear aligners are very popular among young people who prefer not to wear visible metal braces. Plus, since the aligners are removable, they are to be taken out when eating meaning there are no food restrictions to worry about. There is no definitive answer to exactly how long your child will need to wear braces as every smile is different and our team wants to create life long results. However, generally speaking, orthodontic treatment can last anywhere from 6 to 30 months. Once treatment is complete, a retainer must be worn for another period of time as the teeth adjust to their new, final positions.